CORPUS CHRISTI, TEXAS (July 31, 2010) The game came down to the bottom of the 11th inning, and Hooks right fielder Freddy Parejo decided it was time to go home, or rather send two runners home, as Corpus Christi downed the Midland Rockhounds 3-2 on Saturday evening at Whataburger Field. Swinging on the first pitch from Midland relief pitcher Neil Wagner, Parejo tagged a grounder down the right side of the 1st base line to score Jimmy VanOstrand and David Cook from second and third, respectively. The win takes Corpus Christi to 2-0 in the series, with their third game slated for a 6:05pm start Sunday. The Rockhounds drew first blood on a 2nd inning on a home run by right fielder Val Majewski. On a 1-2 count, Majewski’s hit cleared the right field fence, landing in the swimming pool for the round tripper. Geoff Blum, on a 3-day rehab assignment from the Houston Astros, started at shortstop for the Hooks. He is the first position player and third player overall to rehab with the Hooks this season. Pitchers Chris Sampson and Felipe Paulino each made one rehab start for the Hooks. Blum played five innings and looked strong in the field, going 0-1 at the plate with a walk and popping out. Jordan Lyles also looked strong on the mound for the Hooks, pitching 5.2 innings, striking out 8 and giving up one run on six hits. In ran into trouble in the 6th inning and was replaced by right hander Erick Abreu. Abreu finished out the 6th inning by striking out Alex Valdez with the bases loaded. Lyles has had problems against Midland this season, going 0-3 in five starts with a 4.97 ERA prior to tonight’s game. The Hooks finally got on the scoreboard in the bottom of the 8th inning. Second baseman Albert Cartwright hit a double off the wall to deep right-center field. Right fielder Freddy Parejo scored from first to even the score. The Rockhounds came back in the 11th on an unearned run by DH Matt Sulentic to give Midland the lead. Then Parejo came to the plate and claimed the 2 RBI that won the game. That raises his RBI total to nine for the season. Left handed pitcher Edwin Walker got the win, raising him to 3-1 for the season. Right hander Neil Wagner was credited with the loss, dropping him to 4-2. Game time was 3 hours 35 minutes with 6,701 fans in attendance. CORPUS CHRISTI, TX (July 30, 2010) After a 9th inning surge by the Midland Rockhounds that saw the bases loaded with one out, the Corpus Christi Hooks hung on to defeat the Midland 4-3 before 7,638 fans at Whataburger Field. Corpus Christi is now 47-57 on the season while Midland posts a 55-49 record. The Hooks jumped out to an early 1-0 lead in the bottom of the 1st inning on a David Cook sacrifice fly to score Michael Affronti from third. Affronti hit a triple off Rockhound pitcher Anthony Capra to get the first hit of the game. Catcher Jonathon Fixler put the Hooks up 2-0 on a homerun on a 3-2 count in the bottom of the third. It was his 5th round tripper of the season. In the top of the 5th, a line drive by Midland catcher Gabriel Ortiz hit Hooks pitcher Jeremy Johnson in the right thigh, bring the fans at Whataburger field to their feet. He quickly recovered; headed to first to get the out on a throw by first baseman Jimmy VanOstrand. Fixler contributed to contribute on a 5th inning RBI, which scored third baseman Jhon Florentino from 2nd base. Filxer picked up the RBI on the single; advance to second on the throw by Rockhounds left fielder Val Majewski. Midland finally got a hit in the top of the 6th on a single by shortstop Josh Horton. They picked up their second hit of the game on the very next batter, when 3rd baseman Adrian Cardenas got a single, advancing Horton to second. Alex Valdez then hit a drive the right field, getting on base and sending Horton home for Midland’s first run of the night. Right fielder Jon Gaston was charged with a throwing error, allowing Valdez and Cardenas to advance to second and third, respectively. The error was Gaston’s first of the season. Pitcher Jeremy Johnson finally got out of the inning, fanning 1st baseman Shane Peterson and center fielder Archie Gilbert to close out the 6th. Things fell apart in the top of the 9th went relief pitcher Evan Englebrook gave up singles to Gilbert and Matt Sulentic, a walk to Ortiz and an RBI single to Weeks to load the bases and score Gilbert from third. Corpus Christi got the second out of the inning on a fielder’s choice single, with a throw to home by Van Ostrand. They closed out the inning and the game on a fly to Martinez in left field. Starter Jeremy Johnson was given the win, while Englebrook was credited with the save. The Rockhounds Anthony Capra earned the loss. With the trade of Roy Oswalt to the Philadelphia Phillies a done deal and of Lance Berkman obviously headed to the New York Yankees; it is clear that the Houston Astros are attempting, and I do mean attempting, to build for the future. With the minor league season having a scant 38 days remaining, there is a possibility that some of these Corpus Christi Hooks may be brought up to fill out the Astros 40-man roster as their season winds down. Gaston, along with pitchers Jordan Lyles and Chia-Jen Lo, all who play for the Hooks were three of my pre-season prospects as future stars for the Astros. Tonight, Gaston went 0-4 with two strikeouts while Lo and Lyles did not see action. The Hooks will face off again against Midland tomorrow with a 7:05pm start. Readers can view this article on "Bleacher Report" by clicking here. HOUSTON, TEXAS (July 29, 2010) Local soccer fans in attendance at the 2010 MLS All Star Game in Houston got a reason to cheer as they saw a local player get into the game and score a goal. Houston Dynamo's forward Brian Ching came into the game in the 46th minute as a replacement for Juan Pablo Angel. The orange clad Dynamo fans in the stands came to their feet when he headed a free kick from David Ferreira past Manchester United goalkeeper Edwin van der Sar. His goal came in the 64th minute, taking the score to 2-1, cutting the Red Devil's lead to one. He came back with an assist in the 90th minute on Dwayne De Rosario's goal. The goals by Ching and De Rosario are all the MLS All Stars could put on the scoreboard. Ching was added to the All Star roster by Commissioner Don Garber as one of his two exclusive picks. "It was really amazing to do that in front of all those fans. It was an incredible atmosphere, and I will always remember that moment," Ching stated in the post-game press conference. He also said, "This was a good night for the MLS. It showed how far the MLS has come. Soccer is the top youth sport out there, and if you look at the crowd we had, I think you could see it is finding its footing, and that’s really exciting." HOUSTON, TEXAS (July 28, 2010) It did not take Manchester United long to get on the scoreboard against the MLS All Stars. In a scant 23 seconds into the game, forward Federico Macheda found the net on a kick from the top of the box to give The Red Devils the lead in the match. From that point, it was all downhill for the MLS All Stars, as Manchester United showed their dominance on the pitch by defeating the MLS All Stars 5-2 before a sellout crowd of 70,728 in Houston’s Reliant Stadium. Macheda came right back in the 13th minute on a pass from midfielder Nani to give Manchester a two goal lead. The first half saw The Red Devils take total control of the game with well executed passes and pin point accuracy on almost every play. Granted, Manchester United is a team that has played together and is prepping for their upcoming season, and the flow and general dynamics of the game showed the disadvantage of attempting to host an All Star Game against an established club. Knowing that MLS head coach Bruce Arena went to the locker room at half time and attempted to make adjustments to enable his squad to raise their level play to matc that of The Red Devils. In the second half, Manchester United continued dto ominate the game, but the MLS began to show a bit of fire when Houston Dynamo forward Brian Ching finally put the All Stars on the board with a goal in the 63rd minute. Manchester came right back in the 70th minute on a solid shot by midfielder Darron Gibson to make the score 3-1. Three minutes later, midfielder Tom Cleverley found the goal from the left side to give The Red Devils a 4-1 lead. Manchester’s offensive assault continued in the 84th minute on a solid shot and goal by newcomer Javier Hernandez. The 22-year old scored two goals for Mexico in the recent World Cup and is the first player for the Mexican professional league ever to be signed by Manchester United. The MLS All Stars got the final goal of the game in the 90th minute when midfielder Dwayne De Rosario took a pass from Ching to score the second goal for the MLS. There will be much written in the next few days about the disparity of the two teams, but never the less, a good game was played for the fans. When all was said and done, the Manchester United players accepted the trophy for their victory as the fans stated in the stands to honor the champions. Noticeably absent from the awards was Manchester United long time head coach Sir Alex Ferguson. But that was to be expected. After 24 years at the helm of The Red Devils, he knew it was his players’ time to shine. After all, they were the ones who had played the game and they deserved the honor. So another chapter in the MLS storybook is laid to rest. Next year will bring new challenges and goals for the MLS and its All Star Game. Let hope next year's edition will continue to elevate soccer the United States. BIRMINGHAM, ALABAMA (July 23, 2010) - A league-high 10 student-athletes from Prairie View A&M received 2010 Preseason All-SWAC honors as the Panthers were picked to win the SWAC West during the annual SWAC Football Media Day in Birmingham, Ala.
Senior quarterback K.J. Black was picked as the league’s preseason offensive player of the year after earning the honor last fall. 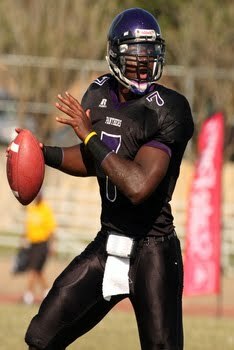 A member of the Walter Payton Award Watch List and a Preseason All-SWAC First Team Selection, Black finished as the top passer among the Football Championship Subdivision ranks in 2009 with a 172.8 pass efficiency rating and a 70.4 completion percentage. The Louisville, Ky. native also threw for 2,033 yards and 22 touchdowns while only recording four interceptions in his first season at Prairie View. Also earning All-SWAC Preseason First Team offensive honors were linemen Tim Tusey, James Dekle and running back Donald Babers. Last season, Tusey and Dekle blocked for a unit that ranked second among SWAC teams in total offense with 363.9 yards per game. As a result, both earned All-SWAC First Team honors with Dekle also named to the Sheridan Black College All-American Team. Babers, the team’s leading rusher and scorer with 919 yards and 60 total points last season, is a two-time All-SWAC First Teamer. Earning first team honors on the defensive side of the ball were defensive end Quinton Spears, linebacker Max Sencherey and safety Chris Adingupu. A 2009 Black College All-American, Spears logged 51 tackles, eight tackles for loss and three sacks last season en route to a first-team appearance. Adingupu led the team in tackles and interceptions as his unit helped Prairie View finish atop the SWAC in pass efficiency defense while Sencherey finished the 2009 campaign as the team’s second-leading tackler with 63 stops. Senior punter Pedro Ventura was also named to the All-SWAC First Team. A 2009 All-SWAC First Teamer, Ventura averaged a career-high 43.8 yards per punt last season to rank fourth nationally among punters on the FCS level. Named to the All-SWAC Second Team were wide receiver Shaun Stephens and placekicker Brady Faggard. The top returning wideout on the roster, Stephens was Prairie View’s second-leading receiver in receptions (36) and yardage (404) while Faggard finished second on the team in scoring with a career-high 56 points in addition to connecting on 35-of-38 PATs and 7-of-8 field goals. After winning the SWAC Championship last season, Prairie View’s quest for a two-peat begins with players reporting on Aug. 8. The first game of the 2010 season will take place on Sunday, Sept. 5 versus SWAC rival Texas Southern in the 26th edition of the State Farm Labor Day Classic at Reliant Stadium with a 4 p.m. kickoff. Prairie View’s first home game is scheduled for Sept. 18 versus Alabama State at 4 p.m. with the annual Cotton Bowl Classic against Grambling State set for Sept. 25 in Dallas at 6 p.m. in the historic Cotton Bowl. HOUSTON, TEXAS (July 21, 2010) After a rash of red and yellow cards beginning in the 84th minute, the Houston Dynamo held on to down Puebla FC 1-0 to win Group B of SuperLiga 2010. Houston Dynamo needed either a win or tie against Puebla FC to advance to the semifinals of SuperLiga 2010. Both teams failed to score in the first half, each having three total shots with no shots on goal. In addition, both teams were issued only one yellow card each. Houston midfielder Lovel Palmer was carded in the 11th minute for a reckless tackle, while Puebla defender Juan Garcia was cited in the 35th minute for the same offense. Even the fouls were kept to a minimum with Puebla committing seven and the Dynamo called for 10. The second half when about the same as the first….until the Dynamo finally found the goal and both teams receive that unwanted rash of yellow and red cards. In the 64th minute, forward Dominic Oduro received a header from forward Cam Weaver and knocked the ball past Puebla goalkeeper Edgar Hernandez for the only score of the match. The score was Oduro’s fourth goal of the season. Then “all hell broke loose” with that rash of yellow and red cards that cost both teams players for the remainder of the match. Pushing, shoving, and slapping occurred which stopped play until it could be sorted out. As usual, extra time was added to compensate for the missed playing time. Other players, as a result of excessive yellow cards in the tournament or red cards issued in this match, will have to sit out the next SuperLiga game for both teams. After everything was settled, two players from each team were ejected, along with 12 cards issued; eight yellow and four red. Seven of the cards were to the Dynamo and five to Puebla. As the Group A champion, the Dynamo will face Monarcas Morelia at Robertson Stadium in the semifinals the first week of August. Puebla will face Group B champion New England Revolution at a yet undetermined date. HOUSTON, TEXAS (July 21, 2010) Coming into tonight’s SuperLiga 2010 game against Puebla FC, the Houston Dynamo held their fate in their own hands. After tying Chivas USA 1-1 on Sunday evening, the Dynamo were 1-0-1 (4 points) in Group A, while Puebla was 2-0-0 (6 points) after a 3-1 thumping of Pachuca on the same evening. The top two finishers in each group advance to the semi-finals and while it seems probable that the Dynamo will advance; their hopes rest on the hope that they can outscore a Puebla squad which has scored five points in two games, while giving up only two. Puebla FC has qualified for the semifinal stage in SuperLiga. Pachuca FC has been eliminated from the semifinals. With a draw or a victory, Houston will qualify for the semifinals. Chivas USA need to defeat Pachuca and have Puebla defeat Houston, and also over tuen a minus-2 goal differential. In any case, the Dynamo hold their own fate in the hands, or should I say with their feet. SAN MARCOS, TEXAS (July 21, 2010) Allstate Insurance Company and the American Football Coaches Association (AFCA) announced that Texas State junior center Steven Kenney is among 112 student-athletes nominated for the Allstate AFCA Good Works Team®. It is the most players nominated in the 19-year history of the award. In the areas of giving back and volunteerism, the Allstate AFCA Good Works Team® represents the "best of the best" among more than 50,000 student-athletes playing football at all four-year institutions, and is widely recognized as the most prestigious community service award in college football. Kenney is one of only 16 Division I FCS representatives, who were announced as nominees for the 22-man Allstate AFCA Good Works Team. He is the only FCS player from Texas, one of 12 players from all Divisions from the Lone Star State to be nominated. Kenney also joins Northwestern State’s Justin Aldredge as the only two Southland Conference competitors to be selected. From the record 112 nominees submitted by sports information directors on behalf of their schools, a special voting panel consisting of former Good Works Team® members and prominent college football media members is responsible for selecting two 11-player Good Works Teams® - one comprised of players from the NCAA Football Bowl Subdivision and another representing players from the NCAA Football Championship Subdivision, Divisions II, III, and the NAIA - to be announced in September. College Football Hall of Fame member and ESPN broadcaster Lou Holtz is returning for a third year to serve as spokesperson for the program and raise awareness for the stories of the nominees and team members. Kenney is a three-time member of the Southland Conference Commissioner’s Honor Roll and receive Texas State’s Oak Farms Dairy Academic Award in 2008 and 2009. He has a series of community service activities through Texas State. They include serving as a tutor in math and chemistry for the Texas State Athletic Academic Center, serving as a mentor for special needs children through work with the Texas State Peer Buddies program, being involved in several community service projects including Bobcat Build, a Texas State project that enlist students to go out into the San Marcos community and help with things such as yard work, painting, neighborhood clean-up among other things. In addition, he has also volunteered at the Wonderland School Carnival, Travis Elementary School Reading Program and for the Salvation Army at CVS Pharmacy in San Marcos. Kenney participated in the Texas Hill Country Adventure with the Sunshine Kids, an organization that provides positive and fun activities for young children with cancer. His work with Special Olympics began at Pearland High School when he was a volunteer bowling coach. Kenney is a two-year letterman at Texas State who was the starting center for the Bobcats last season. He graded out at 83 percent on 740 snaps in his first season as a starter. He also recorded 33 knockdown blocks and helped anchor a Texas State offensive line that ranked among the nation's Top 25 offensive lines for fewest sacks allowed with an average of just 1.36 per game. The Bobcats also had one of the nation's top seven passing offenses and 12th best overall offensive teams with an average of 288.9 yards passing per game and 422.2 total yards. "In the third year of our partnership with the AFCA, Allstate, our employees and our agents continue to be inspired by the stories of class and character displayed by these young men," said Guy Hill, vice president of sales and service for Allstate, who also serves on the Allstate AFCA Good Works Team® voting panel. "We applaud the commitment of these 112 student-athletes to positively impact their communities with innovation, creativity and passion that reflects so well on their sport, and their respective institutions." This year's class of nominations includes student-athletes with a wide range of accomplishments, including developing programs to support Haitian relief efforts, working with rural and minority students to help them reach their goal of attending medical school, and organizing a campus fundraiser to incentivize students to shave their heads to raise money for pediatric cancer research. "For the third straight year, the AFCA is pleased to partner with Allstate in highlighting football student-athletes who have achieved outstanding success, both on and off the football," said Grant Teaff, AFCA Executive Director. "From the record total of nominees that were submitted from colleges and universities around the country, it is apparent that collegiate football is producing some of the best and brightest that our country has to offer." ESPN.com will launch a customized Allstate AFCA Good Works Team® web site featuring profiles and images of the final 22 award recipients, as well as unique and interactive content for college football fans. For the first time in the program's history, fans will be able to vote for a Team Captain on ESPN.com. The 2010 Allstate AFCA Good Works Team® voting panel includes: former Good Works Team® members Matt Stinchcomb (Georgia, 1997, 1998 teams), Mike Proman (Amherst, 2002 team), Mewelde Moore (Tulane, 2003 team), Brian Brenberg (St. Thomas, 2001 team), Zaid Abdul-Aleem (Duke, 1994 team); media members Holtz (ESPN), Pat Forde (ESPN.com), Tom O'Toole (USA Today), Gary Shelton (St. Petersburg Times), Blair Kerkhoff (Kansas City Star); current AFCA President and Mount Union College Head Coach Larry Kehres; 1996 AFCA President Fisher DeBerry, former head coach at the United States Air Force Academy; and Hill. MONCTON, CANADA (July 21, 2010) Current Texas women's track and field standouts, Chantel Malone and Stacey-Ann Smith, advanced to the 400m final at the 2010 IAAF World Junior Track and Field Championships Wednesday afternoon at Moncton 2010 Stadium. Malone, who will be a senior this fall in Austin, clocked a 53.37 to win her semifinal heat and automatically qualify for Thursday's final. The British Virgin Islands native posted the third-fastest time overall in the first round (52.97), held on Tuesday, and entered the meet ranked second in the world junior ranks with her 52.35 personal best set in May at the Texas Invite. Smith, running for the United States, also advanced by finishing second in her heat, only behind Malone, in 53.48. The junior made it out of the first round with a 53.41, the sixth-fastest time overall. The 400m final will be run at approximately 6:50 p.m. Central time on Thursday. Also competing on Thursday will be incoming freshman Danielle Dowie (Jamaica) in the 400m hurdles first round, Malone in the long jump qualifying at 9:15 a.m. CT and incoming freshman Allison Peter (U.S. Virgin Islands) in the 200m first round at 7:55 a.m. CT.
FORT WORTH, TEXAS (July 21, 2010) Dave Borelli has been named the new head coach of the TCU women’s tennis program, Director of Intercollegiate Athletics Chris Del Conte announced Wednesday. Borelli, who has spent the last four seasons as coach of the TCU men’s team, will move back to exclusively coaching the Frog women, a role he previously held for four years from 2002 through 2006. Borelli will be returning to the role that saw him already log a distinguished career by the time he took over the reigns of the Frog men’s program. He owns a 374-75 record in 18 seasons as a women’s head coach, including a 72-30 mark in four seasons with TCU from 2002 through 2006. Accomplishments in the world of women’s tennis have earned him a spot in the Intercollegiate Women’s Tennis Hall of Fame. He will become only the third male coach ever enshrined by the organization Nov. 13 in Williamsburg, Va.
"Dave is a Hall of Fame coach and a great fit at TCU," Del Conte said. "He has been an ambassador for our tennis programs. "We achieved tremendous success with Dave previously at the helm of our women's team. We share his vision and high expectations for the program." A 1974 graduate of USC, Borelli began his career as women’s head coach for the Trojans, going 302-45 with seven national championships from 1974 through 1988. USC players combined to win five individual national championships in singles and one in doubles under his guidance, and he was named NCAA Coach of the Year in 1981. Borelli, whose overall career record stands at 428-120 in 21 seasons, recently completed his fourth season with the TCU men by leading the squad to the Mountain West Conference tournament championship and the team’s 19th NCAA tournament appearance in the last 20 years. The Frog men totaled four MWC titles overall (two regular season, two tournament) under Borelli’s tutelage. Prior to arriving at TCU, Borelli served as the men's professional tour coach for the USTA. He was in charge of the rookie pro program for USA player development. HOUSTON, TEXAS (July 19, 2010) University of Houston senior quarterback Case Keenum received another preseason honor Wednesday when he was named to the 2010 Davey O'Brien National Quarterback Award Watch List. The O'Brien Award is presented annually to the best college quarterback of the year and is the nation's oldest and most prestigious quarterback award. The O'Brien honors candidates who exemplify Davey O'Brien's enduring character while exhibiting teamwork, sportsmanship and leadership in both academics and athletics. The watch list was compiled by a subset of The O'Brien National Selection Committee, which based its criteria on player performances from the previous year and expectations for the 2010 college football season. This was only the most recent preseason honor for Keenum. Earlier this month, he was honored as one of only 22 players to be named to the Johnny Unitas Golden Arm Award Watch List. He was honored as a "Favorite" for both the College Football Performance Awards National Performer of the Year and the College Football Performance Awards Quarterback Trophy. In addition, the Abilene, Texas, native has been named to several Preseason All-America Teams. Keenum and other Cougar student-athletes are expected to earn additional preseason honors and be named to other national award watch lists during the next few weeks. A year ago, Keenum led the nation in total offense for the second straight season, averaging more than 400 yards per game. He posted a school-record 5,671 passing yards with 44 touchdowns and helped lead the Cougars to a 10-4 overall record and fifth consecutive bowl appearance. With his passing yardage, he became only the second player in NCAA Division I Football Bowl Subdivision history with multiple 5,000-yard passing seasons during his career. He enters the 2010 season on the cusp of setting many NCAA Division I-FBS passing and total offense career records. HOUSTON, TEXAS (July 18, 2010) With an overcast sky, rain in the forecast and the temperature a muggy 80 degrees, the Houston Dynamo faced off against Chivas USA in the second match for both teams of SuperLiga 2010 on Sunday evening at the University of Houston’s Robertson Stadium. Houston was coming off a 2-1 win over Pachuca CF on Thursday night at home, while Chivas fell to Puebla FC 2-1 at the Home Depot Center. Both teams battled for supremacy in an attempt to advance to the second round, but the best each team could do was settle for a 1-1 tie. The Dynamo struck first on an unassisted shot from the top of the box by midfielder Lovel Palmer in the 6th minute. Spirited play and a reckless tackle by Dynamo defender Andrew Hainault in the 18th minute resulted in the match’s first yellow card. Teammate Eddie Robinson picked up the Dynamo’s second yellow card of the match for a technical foul in the 35th minute while attempting to defend a Chivas USA attack in front of the Dynamo goal. In the 45th minute, Dynamo forward Corey Ashe got the ball at midfield and began solid run towards Chivas’s goal; passing off to forward Cam Weaver in the final scoring attempt of the 1st half. Chivas USA goalkeeper Dan Kennedy got a hand on it before it found the goal, to keep the score at 1-0 at the half. Chivas USA received their first yellow card of the match when defender Michael Umana got a bit reckless on a tackle in the 41st minute. The second half saw Chivas USA substitute Osael Romero for Marcelo Saragosa in an obvious attempt to close down the Dynamo attack from the middle. Palmer make a daring right footed attempt at the goal in the 49th minute to try to increase Houston’s lead, but a quick body block and catch by Kennedy foiled the attempt. In the 57th minute, Houston substituted midfielder Danny Cruz for Brad Davis. Cruz was given a rousing round of cheers by the Dynamo fans, the Batallon, and the Texian Army as he left the field. Ashe made another spirited run at the goal in the 65th minute, receiving that ball at the left side, about 15 yards out. He sailed a shot across the bow of the goal, barely missing the net by the width of the ball. Chivas finally got on the scoreboard in the 71st minute when a corner kick by midfielder Rodolfo Espinoza was headed by midfielder Jesus Padilla right past the outstretched arms of Dynamo goalkeeper Tally Hall. The Dynamo quickly came back with two shots from 12-yard out in the 73rd and the 75th minute. Neither shot found it way into the goal to keep the score even. Chivas substituted midfielder Ben Zemanski for Blair Gavin and came back one minute later with another substitution; defender Mariano Trujillo for Carlos Borja. Dynamo defender Adrian Serioux went down at midfield in the 83rd minute, grasping his left leg in pain. He was quickly pulled from the game and replace with Richard Mulrooney. After four minutes of stoppage time, the score remained at a one-all tie. The Dynamo are now 1-1-0 (4 points) after two games of Group A of SuperLiga 2010. Chivas USA is 0-1-1 (1 point). Houston will face Puebla FC at 7:00pm Wednesday, July 21 for their final game of the first round. Chivas USA will face Pachuca CF at the Home Depot Center at 7:30pm (PST), also on Wednesday. HOUSTON, TEXAS (July 18, 2010) Junior guard Trumaine Johnson became the newest member of the University of Houston men's basketball program Friday after signing a Statement of Financial Aid, head coach James Dickey announced. "We are so excited to welcome Trumaine to our basketball program," Dickey said. "He is an explosive guard who can score and play hard-nosed defense. Trumaine is a veteran who helped lead his team to the NCAA Tournament. His experience certainly will be valuable to our program." Following his signing, an excited Johnson said he was happy to return to an area he knows well. "Houston is my hometown, and I have always been a fan of the Cougars," Johnson said. "This is home, and everybody loves home. I am glad to be back." With his signing, Johnson became the sixth member -Dickey's initial recruiting class at Houston. He joined Navarro Junior College guard Darian Thibodeaux, Midland Junior College forward Jonathon Simmons, Second Baptist High forward Mikhail McLean, Hyde Park Academy guard Fabyon Harris and Little Rock Central forward Alandise Harris. Throughout his recruitment, Johnson said he always enjoyed speaking with Dickey, associate coach Alvin Brooks and assistant coaches Daniyal Robinson and Ulric Maligi. That played a major impact on his final decision. "I felt very comfortable speaking with Coach Dickey and all the coaches,'' Johnson said. "I enjoyed their personalities and felt relaxed around them." A Houston native, Johnson graduated from Kingwood High in 2007 before competing at San Diego for two seasons from 2007 to 2009. He helped lead the Toreros to the second round of the 2008 NCAA Tournament. He attended school at Diablo Valley College but did not play basketball during the 2009-10 season. As a sophomore at San Diego in 2008-09, Johnson averaged 11.6 points to finish third among the Toreros in scoring. He led USD in scoring four times that year, including a season-best 22 points in games against San Francisco and Santa Clara. Johnson posted 5.7 points per game as a freshman in 2007-08, including a season-high 22 points against Pepperdine. Starting 16 of 35 games that year, he raised his scoring average to 7.6 points per game in West Coast Conference play. During his high school career, Johnson scored 40 or more points in a game four times and helped lead two teams to the state semifinals. As a senior at Kingwood High, he averaged 9.0 points, 7.0 assists and 3.5 steals per game while helping lead the team to the state semifinals and a national ranking in the USA Today Super 25. Johnson also was tabbed as the District Defensive Player of the Year and earned All-District and All-Region honors. He spent his sophomore and junior seasons at Diboll High where he received numerous awards. As a junior, he averaged 28 points, 8 assists and 3 steals on the way to being named the league's Most Valuable Player and earning All-Region and All-State Honors. During his first year at Diboll High, he earned All-District First-Team and All-Region Accolades and was named the league's Newcomer of the Year. Johnson also helped lead the Mustangs to the state semifinals and a No. 1 ranking in the state. MARSHALL, TEXAS (June 17, 2010) Four days following another successful installment of the “Rumble in Humble” Pro-Am Boxing Extravaganza, Joe Dumas Productions & Associates (Foreman Group) took its show on the road for the start of the George Foreman Heavyweight Title Series in Foreman’s hometown of Marshall, Texas this past Tuesday. The headliner in Tuesday’s event at the Marshall Convention Center featured Foreman’s son, George “Monk” Foreman III, making his state of Texas debut as a professional along with nine other pro fighters from the states of Texas, Louisiana, Arkansas and Virginia. Foreman III (8-0, 8 KO), a 6-5, 238-pound heavyweight who hails from Humble, Texas, took on Texarkana, Texas native Bobby Pickett (0-3) in his eighth professional fight. With his dad, former heavyweight champion George Foreman looking on along with a sizable contingent of family members, “Monk” took care of business from the opening bell and used his visible size advantage to frustrate Pickett with two knockdowns towards the latter end of the first round. Pickett managed to make it to the final bell but failed to begin round two as the fight was stopped at the 10-second mark. As a result, Foreman’s undefeated record remained intact in addition to posting his eighth consecutive knockout. With the task of carrying and upholding the family name, Foreman III admitted there was some pressure to perform well before the fight began but put it aside once the opening bell rang. A Culver (Ind.) Military Academy graduate who attended Pepperdine University before transferring and earning a business and sports management degree from Rice University in Houston, Foreman III wants to continue honing his skills and become a household name in the region. “I’m going to keep working on perfecting my jab, developing my fighting style and fighting in the region of Arkansas, Texas and Louisiana,” he said. 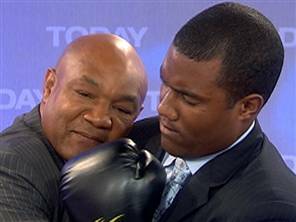 With the support and familiarity of the city of Marshall leading up to the fight, Monk’s manager and father, former two-time heavyweight champion George Foreman, said the city will play a big part in his son’s future plans. PRAIRIE VIEW, TEXAS (July 16, 2010) Prairie View A&M quarterback K.J. Black is one of 20 players named to the initial Walter Payton Award Watch List earlier this week. The award, sponsored by Fathead.com, is presented to the top offensive player on the Football Championship Subdivision level. A native of Louisville, Ky., Black put together a storybook season in 2009 as the senior-to-be guided Prairie View A&M to its first SWAC Championship since 1964 with a 9-1 record. Undefeated as a starter (8-0), Black also finished as the top passer among the FCS ranks with a 172.8 pass efficiency rating and a 70.4 completion percentage. He also threw for 2,033 yards and 22 touchdowns while only recording four interceptions. As a result of his accomplishments on the field, Black was selected as the Offensive MVP by the Southwestern Athletic Conference, Sheridan Broadcasting, Heritage Sports Radio Network and Black College Sports Page. He also earned the Paul Duffy Award by The Pigskin Club of Washington, D.C. Updates to the Payton Award Watch List will be announced on Oct. 4 and 25. Ballots will be sent to a panel of approximately 200 sports information and media relations directors, broadcasters, writers and other dignitaries after the regular season on Nov. 22. Three finalists will be announced on Dec. 1 and invited to Frisco, Texas for the annual The Sports Network/Fathead FCS Awards Presentation. SAN MARCOS, TEXAS (July 15, 2010) Nine Texas State student-athletes have been named 2010 Arthur Ashe, Jr. Sports Scholars, including four First-Team selections. The First-Team selections are football’s Travis Houston and Alvaro Garcia, women’s tennis player Andrea Giraldo and track and field’s Heather Martinez. Houston started all 11 games and served as a team captain for Texas State's football team that finished third in the Southland Conference with a 7-4 overall record. He owns a 3.59 cumulative GPA with a double major in accounting and computer information systems at Texas State. He ranked fourth on the team with 53 tackles and ranked 15th among Southland Conference leaders 8.5 tackles for losses of 20 yards. Houston also was named an Academic All-Star by the FCS Athletic Directors Association for the second straight year, selected to the Southland Conference All-Academic Team for the third consecutive year and a four-time member of the SLC Commissioner's Honor Roll. He also received Texas State's Oak Farms Dairy Academic Award in the last three years and was a "Cream of the Crop" recipient in 2007. Garcia was named a First-Team selection after earning Second-Team honors last year. He also is a member of the Southland Conference Fall Honor Roll for the second straight year after maintaining a 3.30 cumulative GPA in criminal justice. He caught 22 passes for 305 yards and one touchdown while playing in 11 games. He also caught the longest pass of the season by a Bobcat with a 71- yard reception against Angelo State. Giraldo earned First-Team honors after she was a Second-Team selection in 2008 and 2009. She maintained 3.55 GPA in business management and finance in addition to serving as Texas State’s top singles player during each of the last three seasons. Giraldo posted a 10-6 record in singles play, including a 7-4 mark against Southland Conference opponents in 2010. She has been named to the Dean’s List four times and a member of the Southland Conference Commissioner’s Honor Roll in 2007, 2008 and 2010. Heather Martinez is a two-time Arthur Ashe First-Team selection after maintaining a 3.93 cumulative grade point average. She competed in two cross country meets for the Bobcats in 2009 and has been named to the Dean’s List every semester of enrollment at Texas State. She earned Oak Farms Dairy and Texas State’s “Cream of the Crop” award from 2007-09 and is a four-time member of the Southland Conference Commissioner’s Honor Roll. The Second-Team selections were women’s basketball player Verinus Kalu and women’s tennis player Amanda Alvarado. Kalu maintained a 3.51 GPA to earn Second-Team honors. She played in 20 games and averaged four points and three rebounds. She also was named to the 2010 SLC Commissioner’s Honor Roll and received an Oak Farms Dairy and Texas State Academic award in 2010. Alvarado was named a Second-Team selection after maintaining a 3.58 GPA during the last two years. She was chosen an Honorable Mention selection in 2009. She has been named to SLC Commissioner’s Honor Roll twice. Football’s Darius Bolden and softball’s Kristina Tello were Third-Team selections. Bolden maintained a cumulative 3.23 GPA while majoring in industrial engineering. He is a two-time member of the SLC Commissioner’s Honor Roll and caught 156 passes for 204 yards and a touchdown in 2009. He also earned an Oak Farms Dairy and Texas State academic award. Tello maintained a 3.24 cumulative GPA while earning a bachelor’s degree in business management. She was the Bobcats' leadoff hitter, and led the 2010 team in at-bats and triples. Tello finished her career ranked fourth in runs scored with 103, ninth in career triples with six, and recorded 69 career walks for sixth all-time. Tello was named to the Dean’s List once, an Oak Farms winner from 2006-09, an SLC Commissioner’s Honor Roll recipient from 2007-09, and earned the 2007-08 SLC Softball All-Academic Second Team accolades. Track and Field’s Jiovanna Martinez maintained a 3.20 GPA in nutrition and foods, and was named an Honorable Mention Arthur Ashe winner for the second straight year. She was named to the Dean’s List twice, and was an Oak Farms Dairy Award winner from 2006-09 and a SLC Commissioner’s Honor Roll recipient from 2007-09. A thrower for Texas State’s track and field team, Martinez placed ninth in the weight throw and 11th in the shot put at SLC Indoor Championships. The Arthur Ashe Jr. Sports Scholar awards were created to honor undergraduate students of color who have made achieving both academically and athletically a winning combination. To be included, student-athletes have to compete in an intercollegiate sport, maintain a cumulative GPA of at least 3.2, and be active on their campuses or in their communities. HOUSTON, TEXAS (July 15, 2010) University of Houston head baseball coach Todd Whitting announced the hiring of Jack Cressend as assistant coach on Thursday. Cressend comes to Houston after spending two seasons at Tulane. As a member of Whitting’s staff, he will serve as the program’s pitching coach. The Mandeville, La., native returned to his alma mater, Tulane, in 2009 after an 11-year professional career, including five in the Major Leagues. During that career, Cressend was named the Boston Red Sox’s Minor League Pitcher of the Year in 1997 and was a member of the American League Central Division Champion, Minnesota Twins. His best season in the major leagues came in 2004 with the Cleveland Indians, when he posted a 2.51 ERA in 43 innings. Throughout his entire professional career Cressend made 370 appearances on the mound with 820 strikeouts. Prior to his professional career, Cressend played for the Green Wave from 1994-96. He saw action on the mound and in the outfield and was a member of NCAA Tournament teams in 1994 and 1996. The 1996 team also took home the Conference USA Tournament title, with Cressend being named to the All-Tournament Team after pitching a complete game shutout with 11 strikeouts in the championship game against South Florida. Following his time in professional baseball, Cressend served as an area scout for the Tampa Bay Rays from 2006-2008. During that time he also founded the Louisiana Knights, a traveling baseball team that helps high school players get more exposure to college coaches. During the two years he was associated with the team, he helped more than 40 players reach the college ranks. For the past two seasons, as a member of the Green Wave staff, Cressend assisted head coach Rick Jones, with recruiting. Additionally, he was in charge of scheduling, summer baseball player placement and served as the team’s pitching coach. Cressend earned his bachelor’s degree from the A.B. Freeman School of Business at Tulane in 2008. He and his wife, Katy, have two sons, Cole and Cameron. ANAHEIM, CALIFORNIA (July 13, 2010) The first round of the State Farm Home Run Derby is complete and the results are listed below, in the order they batted. 1. Chris Young-Arizona Diamondbacks (RH): 1 Home Run: average: 410 feet; longest: 416feet. 2. Vernon Wells-Toronto Blue Jays (RH): 2 home runs; average: 395 feet; longest: 428 feet. 4. Nick Swisher-New York Yankees (LH): 4 home runs; average: 412 feet; longest: 440 feet. Cabrera, Ortiz, Hart and Ramirez advance to the second round. ANAHEIM, CALIFORNIA (July 12, 2010) Here is the batting order for the State Farm Home Run Derby at the 2010 MLB All Star Game at Angel Stadium in Anaheim, California. I am picking Nick Swisher to win it all. HOUSTON, TEXAS (July 12, 2010) The 33rd Annual Reliant Park World Series of Dog Shows, held July 21 to 25 in Houston’s Reliant Center, boasts two special attractions this year. The first is the AKC Weight Pull competition. The second is an extra specialty club show on Wednesday, July 21, offering “get-in-free” hours -- from 3:00 to 5:30 p.m. -- designed to draw shoppers to the Show’s ever popular McScotty Market. Pincus jokes, “Shoppers may wish they had a Malamute to haul out their purchasers from the McScotty Market.” Here, hundreds of booths offer toys, equipment, grooming supplies and food for dogs plus plenty of dog-related gifts and bling for dogowners. Wednesday’s special shopping hours are perfect for those wanting to save their money on admission and parking fees and spend it instead on a special item from the McScotty Market. If shoppers miss the “get’-in-free” hours on Wednesday, they can still enjoy the McScotty Market -- as well as the rest of the dog show -- on any of the remaining show days. “Over the five days, a total of six shows actually go on, allowing dogs to compete multiple times during the week to rack up as many points as possible,” he says. “As the fourth-largest cluster show in the country, it’s a wealth of opportunity for competitors and offers several chances for the people to see their favorite events. 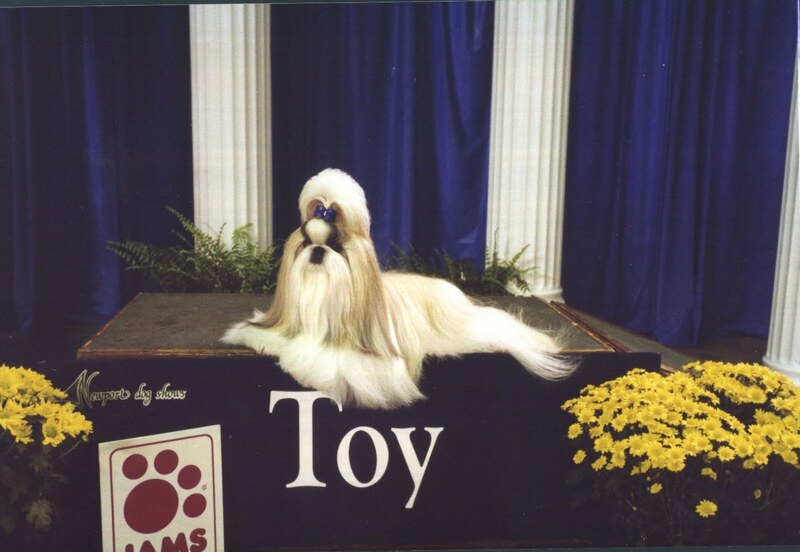 ”The Show this year will continue to highlight classic events such as Conformation, which involves the judging of nearly perfect examples of more than 150 breeds on standards set by the American Kennel Club. Meet the Breed is a kid-friendly exhibition giving potential dog owners the chance to get up close andpersonal with selected breeds and talk to experts about what they can expect from each one. The Mari Jon Filla Student Art Exhibition is also a must-see. Pincus says the Performance Events and Exhibitions are usually the most exciting for families. “If you’re looking for real entertainment, follow the cheers and shouts,” he says, “and you’ll find dogs alone or in teams running and jumping in the agility courses, mastering obedience trials, catching FrisbeesSM like canine acrobats or dancing in the Musical Freestyle. Attendees should be on the look out for the Sixth Annual C.A.P. Designer Doghouse Competition and Silent auction, where the most glitzy and glamorous doghouses in town are available for sale to benefit Citizens for Animal Protection. Eukanuba is a major sponsor of the show. Adult admission is $10 per day at the door or via Ticketmaster. Tickets for senior citizens are $5 and for children 12 or younger are $1 with adult. Visit www.reliantdogshows.com for specific times and schedules, photos and videos, or follow us on Twitter (@Houstondogshow). HOUSTON, TEXAS (July 12, 2010) The George R. Brown Convention Center will serve as a major hub of activities when the 2011 Summer National Senior Games take place at 10 Houston-area venues next year. More than 15,000 athletes age 50 and older will compete in 18 medal competitions and two demonstration sports June 16-30, 2011. Eight of the 18 medal events take place inside the downtown convention center: archery, badminton, basketball, horseshoes, shuffleboard, table tennis, tennis, and volleyball. The games will be preceded with an Olympic-style torch run and flame arrival ceremony on June 15, 2011, with the flame burning for the duration of the games at a downtown location. The Celebration of Athletes event takes place at Toyota Center on June 21, 2011. “We look forward to welcoming America’s senior athletes with open arms,” Houston Mayor Annise D. Parker said at a press conference Thursday to begin the yearlong countdown toward the games. “Houston has been down this road before and we know how to put on major sporting events. “In 1986, we hosted the U.S. Olympic Festival to great success. And, of course, we hosted both the Super Bowl and the Major League All-Star Game in 2004. In 2006, we hosted the NBA All-Star Game and next year we also host the NCAA Men’s Final Four. All athletes will have earned the right to compete in these national games by virtue of their performance at their respective state games. With 15,000 athletes and an anticipated 30,000 spectators, the 2011 Games are estimated to create an economic impact of approximately $50 million for the Houston region. The official competition schedule is posted at www.nsga.com.